Premium, no-sheen, natural-look, solvent-based penetrating sealer formulated to provide maximum stain protection, especially in food preparation and serving areas. May also be used as a pre-grouting sealer. Allows moisture vapor transmission. 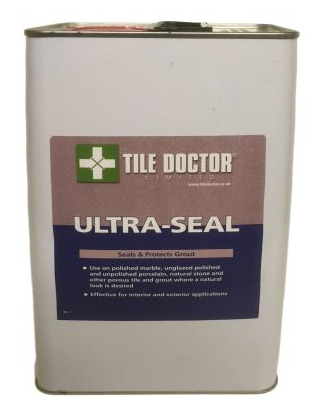 It is also an excellent grout sealer. Use on Basalt, Cement Pavers, Encaustic Cement, Flagstone, Grout, Granite, Limestone, Masonary, Porcelain, Quarry Tile, Slate, Terracotta, Travertine and Victorian Tile where a natural look is desired. Effective for interior and exterior applications. Apply using a sponge, brush, paint pad, cotton towel, or sprayer. NOTE: Be sure any sealer that does not penetrate surface is polished dry off surface within 5 minutes of each application using absorbent paper or cotton towels. After two hours conduct a test to determine if surface is completely sealed by applying water droplets to the surface. If water is absorbed, apply an additional coat. Wait 2 hours and repeat the test. Ready for surface traffic in two hours after final coat. Keep area dry for twelve hours. Achieves a full cure in twenty four hours. Clean applicator tools with mineral spirits after each use. A one litre bottle will cover approximately 10m² to 25m² (100 to 350 sq. ft.) per coat, depending on type of stone, porosity and texture of surface, temperature, humidity, and method of application. Available in 1 litre tins at £36.00 each or 5 litre tins at £ 165.00 each, postage and packing £5.50 for a one litre tin, £10.00 for two or more litres (All prices are shown inclusive of VAT).